She Explored New Byways To Love In Her Search For Fulfillment! Evelyn Was Torn Between Two Kinds Of Love! Evelyn Jones — “Casey” to her intimates — was the free-wheeling sweetheart of Canver County Hospital who took her love where she found it… and she found it in many, many places. 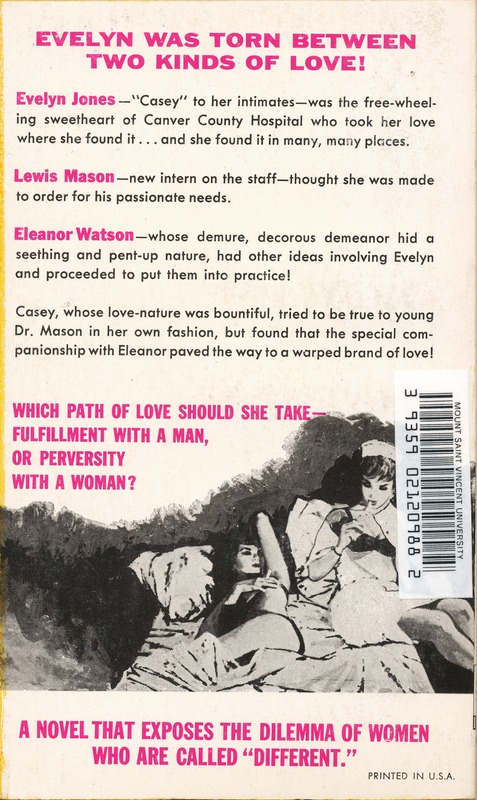 Lewis Mason — new intern on the staff — thought she was made to order for his passionate needs. Eleanor Watson — whose demure, decorous demeanor hid a seething and pent-up nature, had other ideas involving Evelyn and proceeded to put them into practice! Casey, whose love-nature was bountiful, tried to be true to young Dr. Mason in her own fashion, but found that the special companionship with Eleanor paved the way to a warped brand of love! Which Path Of Love Should She Take — Fulfillment With A Man, Or Perversity With A Woman?